Big changes are coming to CHUV. Download a readable map, instructions on how to read it and learn details of how to weigh in HERE. UPDATED: The Saturday, November 5th Neighbor to Neighbor discussion location has changed and will be held at the GREENLAKE Library from 11:15 am to 1:00 pm. Thank you. 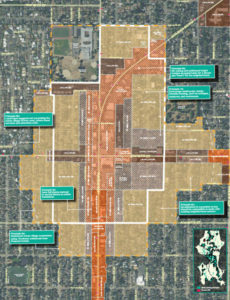 Want to learn more about the draft zoning maps the City has proposed for our urban village? 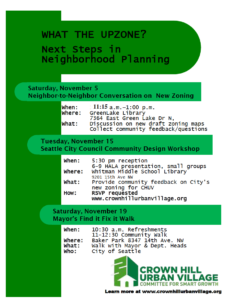 Come join your neighbors from Crown Hill Urban Village Committee for Smart Growth at Greenlake Library on Saturday, November 5 from 11:15 am to 1:00 p.m. We’ll talk about the new borders, the zoning changes, what we know about the goals of the upzone and how our platform of recommendations has influenced the City’s work. We’ll be opening a neighbor to neighbor discussion on the draft maps, gathering your questions, answering what we can, and sharing them with the City to get complete answers to as many of your concerns as possible. Keep an eye on this blog for more details on the November 15 meeting; which we will share with the community once the City Council staff provides us with details. Please help us spread the word about all three important events that are happening in CHUV in November by downloading our flyer and sharing it with your neighbors or posting it in your apartment building. We welcome Owners, Renters, Landlords and Businesses to join this conversation about the future of our community. Thank you.